Over the past two months we have had the pleasure of hosting Gavin Zheng, a Summer intern from the West Side YMCA’s Teen Career Connection program. By way of quick background, the YMCA program is designed to provide high schoolers with opportunities to explore career paths, build their resumes, and learn professionalism. When first considering our participation, we recognized the importance of tempering our expectations, especially as we were signing up for a high school intern program. Our attitude and expectation was to “give more than we received” and, being a mission-driven organization, we were quite okay with that. Boy, were we far off the mark. We are pleased to share that not only did Gavin get a chance to grow his resume, but he also served as a vital contributing member of the Mink Hollow team. This post highlights his activities (and I suppose summarizes some of our Summer’s work as well) but also surfaces additional valuable lessons that may be applied more broadly in our industry. Gavin gives a glowing review of MHA at the Teen Career Connection Presentation Night! · New Product Introduction. For a national broker dealer, Mink Hollow was engaged to develop the business case for introducing a new product. The final deliverable was a presentation destined for the senior executive committee. The assignment required intensive market research including competitive intelligence gathering and an analytical component, modeling product adoption and revenue projections. Gavin assisted the team in conducting detailed research on the firm’s competitors, including thorough combing of SEC filings and investor reports and identifying many ‘nuggets’ of useful information. · 2018 Strategic Planning Assignment. – Mink Hollow as engaged by a top broker dealer to support a Board-level 2018 strategic planning discussion. 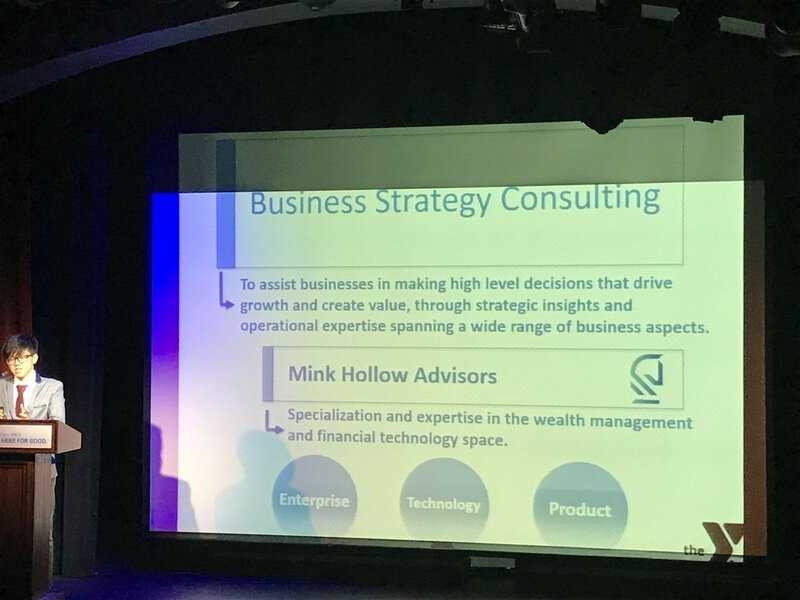 Leaning on our internal research database and knowledge in wealth technology, Mink Hollow delivered a series of opportunities to help expand organic growth. Gavin conducted research on breakthrough ideas like Artificial Intelligence and Robotic Process Automation and how they can be used in wealth management. He also provided competitive intelligence research and helped build slides to contribute to the final deliverable deck. · Annual Sales & Marketing Strategy. A long-term client was headed to NYC in part to reset the Sales and Marketing plan. Preparing for this two-day session required lots of advance work to construct the agenda, including a ½ day brainstorming session regarding a new service offering. Gavin was not only key in the preparation, but was an active participant in these meetings, even helping with the profit modeling related to the new product offering. Mink Hollow learned a lot about ourselves in the process. For starters, don’t underestimate the capabilities of the next generation as an intern or anyone from the younger generation can bring highly-valued fresh perspectives. With 100,000 financial advisors set to retire over the next decade, our industry needs to take note! In closing, Mink Hollow Advisors was delighted to support the YMCA Teen Connections program. In many ways, we were reminded of the saying “Only by Giving are you able to receive more than you already have.” Gavin, we wish you great success.